This easy hamburger stroganoff has been a favorite in our home for many years. I typically make it when the weather changes in Autumn. It is a comfort meal for us. You can buy your own noodles or try your hand at making rustic random sized noodles that really are delicious and very inexpensive to make. If you buy your noodles the dish becomes quick and easy! Combine the flour and salt in a large mixing bowl. Make a big well in the center of the flour and crack the eggs into the well. Stir with a fork, incorporating the flour until you have a shaggy dough. Turn the dough onto a counter and knead the dough until it is smooth. If the flour doesn't quite want to completely knead in, that's okay, just leave the excess flour. The amount of moisture you will need depends on the size of the eggs and the humidity in the kitchen. Wrap the dough in plastic wrap and let rest for at least 30 minutes. You can make the dough a day ahead and refrigerate it. 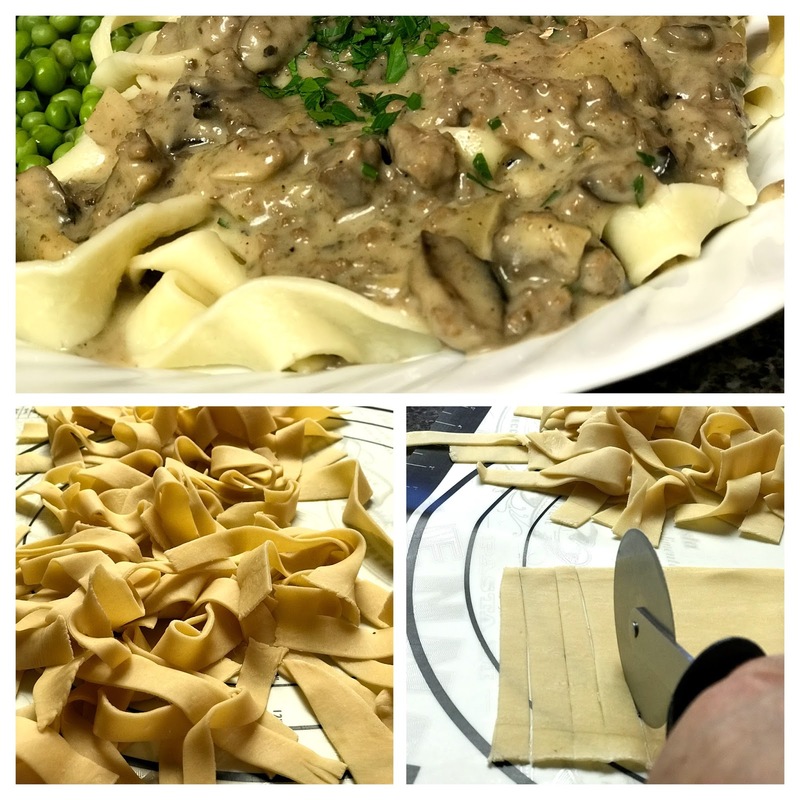 If you have a pasta roller, use it to roll the dough thin, starting with a wider setting and running the dough through, changing the setting each time you run it through, making the space narrower until you have the dough noodle thin. If you are rolling your dough with a rolling pin, flatten it as well as you can with the heel of your hand, and then roll it with a rolling pin on a floured surface. Use a pizza wheel or sharp knife to cut the noodles about 3/4 inch wide or however you prefer. They do not need to be sliced too uniformly but should be similar so that they cook properly. Once the stroganoff is started, put a large pot of salted water on to boil. When the stroganoff sauce is ready to serve, boil the noodles for about 2 minutes. Test them in between to cook to your preference. In a large skillet or dutch oven, melt butter over medium heat. Add mushrooms and onion and garlic to the pan and cook until the mushrooms have released their moisture and onions are translucent. Remove mushrooms and onions from pan and set aside. In the same pan, scramble fry the ground beef until browned. Add the onion and mushroom mixture back into the pan and add the flour, stirring a minute until the flour is well incorporated. Add the Worcestershire sauce, the broth, bouillon base, and parsley. Stir occasionally while the sauce comes to a simmer. Simmer 10 minutes. Add the sour cream and heat through but do not bring to a boil. Season to taste. Garnish with chopped parsley. Must be the season ... I did a very similar meal this weekend ... made the sauce and added in cooked meatballs from the freezer. Let that all simmer and served over broad noodles. I have to try the home made noodles. This is hamburger stroganoff (yes, hamburger is beef) which is fine. I made this recipe to a tee and both my husband and I thought it was overly "sour creamy" tasting. I was fine with the flavours before adding any of my full fat sour cream. I guess just a heads up to add in maybe a half cup at a time and taste to ensure you're happy with it.